Our creamy, lush formula, blooms with a delicious fragrance of royal jelly, honey & propolis, bringing to life our wholesome care that nourishes and renews dry hair. Prized for its reputed healing properties, Honey is believed to be one of nature’s most soothing ingredients. It’s also a natural humectant, meaning it helps maintain hair and skin's natural moisture. Rated 4 out of 5 by tamond from Love It! I just bought a couple of these and I have to say it’s amazing. It really does do what it says. My hair smells and feels great. I agree with the other reviews however, USE ONLY ON ENDS!! I have medium fine hair and I have to be really careful about the products I use on my scalp. But, this mask is great and I’m definitely going to buy more. Drawer full here I come. Rated 4 out of 5 by cubsgirl21 from awesome mask if... This honey hair mask is awesome, but it performs best when you don't follow the directions. The directions say to use from root to tip and unless flat weighed down hair is your look, don't put it all over your hair. Work the mask through the ends of your hair only and it gives beautiful results. My curls loved it, roots not so much. I have purple hair and use masks weekly. This is a mask I would purchase now that I understand that less is more and just do your ends. The scent is lovely as well, a sweet warm scent that stays in your hair all day long. It left my thirsty winter hair moisturized and so soft. I think more people would really love this if the directions were modified to say use on ends only. Rated 5 out of 5 by elspath from Silky smooth hair I tried Garnier Whole Blends Honey Monodose Hair Mask and it made my hair feel so silky smooth. I used it after my regular shampoo and my hair was soft and felt great for a couple days. I even had enough in the little tube for a second application and my hair reaches my mid back. I even had my daughter try some with her straight and static prone hair. We didn't have an issue with winter static until her next wash. I would recommend this product for thin straight hair and for curly/wavy coarse hair like mine. Rated 5 out of 5 by CourtneyDuest from Happy, Healthy, Shiny Hair! Y'all! I don't know why I waited so long to try this! My hair feels a absolutely amazing after the first use, I woke up to super silky, smooth (where did all my frizz go?!) and happy hair! I suffer with dry, brittle, thick, course hair but after using Whole Blendz Honey Hair Mask I no longer need to! My hair has never been happier (can anyone else tell when your hair just doesn't like you?! No? Only me?) and just looks so great overall! I love the Honey Hair Mask. Not to mention, it smells devine! Rated 5 out of 5 by runner0892 from Awesome hair mask! 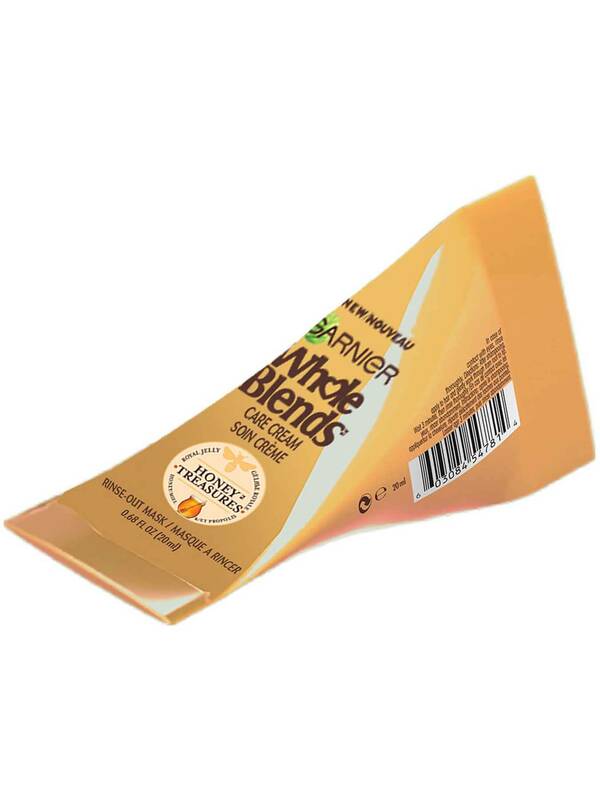 Garnier Whole Blends Honey Monodose hair mask is AMAZING. It smells good and left my hair feeling soft and looking shiny, which ia great especially during the winter months!I will buy this to use every so often, especially during the winter months. Rated 4 out of 5 by emurphy1 from Great for Travel I'll be honest. This hair mask wasn't my favorite, but there are some definite pros that make me want to repurchase. First, the downside: I didn't think this mask left my hair particularly soft, which is how I judge the effectiveness of my masks. When I use a mask, I like my hair to feel softer and more conditioned than with my usual haircare products. Here, I saw a slight difference, but not enough of a change for me to be very impressed by the performance. I also thought the product was maybe a touch too thick, though that was personal preference. The pros: This packaging is AMAZING for travel. When I travel, I usually leave my hair masks at home, because who has room for another jar in their toiletry bag? But I often regret this decision on vacation when long days in the sun ravage my hair. I'd definitely bring the Garnier mask along with me, even if it doesn't perform as well, just because it's so convenient. For my midlength hair, there was enough product, though ladies with long hair might need to be conservative with their application. In addition to the packaging, I also liked the smell of this mask, and found it very easy to apply. Rated 5 out of 5 by missborina from Love this!! WOW! 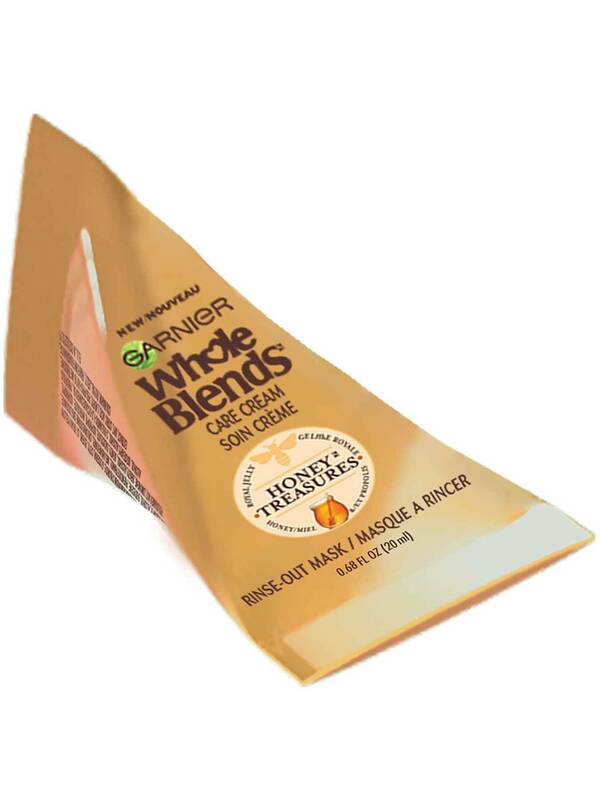 The Garnier Whole Blends Honey Monodose Hair Mask was awesome! I have VERY dry and brittle hair and this has helped restore it back to the shiny, luscious hair that I used to have! The smell is also nice, and not too overpowering. I will DEF. be purchasing this Garnier Hair Mask to use at least once every few weeks from now on! I cant wait to try this on my daughters thick head of hair! Rated 5 out of 5 by mmderemiah from Love this! I was so pleasantly surprised by my experience with the Garnier Whole Blends Honey Monodose Hair Mask. When I first opened the package and rubbed it between my hands, it seemed identical to Garnier Repairing Mask I tried before. It's not! This monodose mask is great! I used it once and I immediately noticed the difference. My partner used it and loved it, too! The Great: The smell is amazing. Warm and gentle - nothing too overpowering but definitely leaves your hair smelling great. The effect it had on my hair - it turned my usual wavy mess of thin strands of hair into a straighter, smoother, and sleeker mane. I usually go to bed with wet hair, then wake up and straighten it (I rarely blow dry). With this product, I went to bed with wet hair and woke up with hair that looked ten times nicer and I didn't even need to turn on my flat iron. The effect it had on my partner's hair - beautiful body, but nothing over the top. My partner has a short cut and she generally blow dries it on a daily basis. After using this product and blow drying, her hair had the look of a fresh cut and revived color. It had a beautiful shine and the perfect amount of volume without looking poofy. The average: I just wish that this type of product could be designed as a daily use product rather than a monodose. I love the effects it had on my hair and feel that I could benefit from using it regularly. The not so great: The packaging - I found it difficult to squeeze the product out (especially with wet hands). And with the sharp edges and the difficulty gripping it, it stabs into the palm of your hand. I think the packaging could be designed in a way that is more shower-friendly. Overall, it's a great product and would encourage everyone to try it. I can't speak to those who have long, thick hair. But for all of us with thin, fine hair - it worked wonders.